Beautycounter Countersun Mineral Sunscreen Mist – I know a few Beautycounter representatives and read some great reviews about this product so I jumped all over this sunscreen. I really like the spray mist because it’s easy when you’re on the go and quick to apply for everyone. The best part about the mineral sunscreen mist is it doesn’t leave you looking ghostly white and it’s NOT greasy! Win-win. Cutlery Caddy – I finally got myself a cutlery caddy and I can’t believe it took me this long. I picked it up from HomeSense for $29.99. It’s great for entertaining such as casual barbeques, potluck style meals, and other fun parties too! Wayfair also has a great selection if you’re looking online. Drop ‘N Bloom Plants – I normally put together my pots from scratch every spring but this year I didn’t have the energy so I decided to try the Drop ‘N Bloom plants from Home Depot. I am not a fan of pansies so I thought this arrangement was a pretty option and offers a bit more interest. I bought three of these plants in white to place in my pots on my front doorstep and driveway. Love them and definitely getting them again for next year. 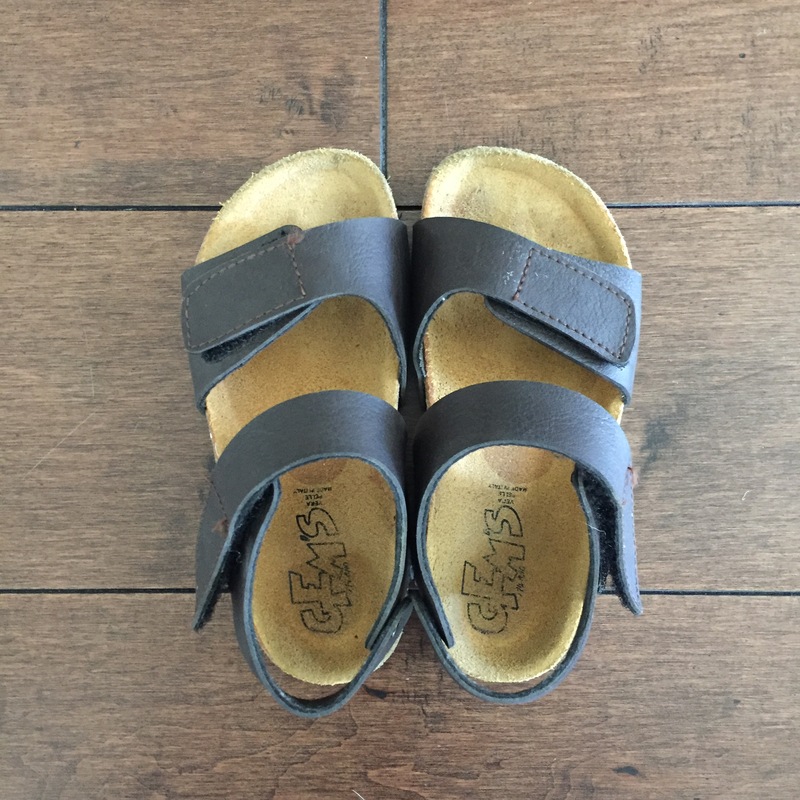 GEM’S Sandals – I wanted Freshly Picked sandals for Luke this summer but they are a tad pricey to wear just for a season so I was really excited when I spotted these at Winners for $19.99 CDN! I tried finding this brand on Amazon or eBay but can’t seem to find them anywhere. They are made in Italy and are nice quality, and they don’t give Luke any blisters. The straps are also velcro making them easy for him to take on and off. I would say they are comparable to Birkenstocks when it comes to look and comfort! I bought them in brown for him but they also came in navy and can be found at Marshall’s too. Roncadin Pizza – I have to give my husband credit on this find because he picked this pizza up at Costco as an impromptu meal when I was away in June. The arugula pizza is soooooo delicious. I haven’t really been looking for it in other grocery stores but I’ll keep my eyes open. Definitely worth grabbing at Costco on your next trip and a yummy option if you’re in a pinch! YETI Rambler Bottle Chug Cap & 8. YETI Rambler White Water Bottle – It’s safe to say we are definitely a YETI household. My husband purchased me a white water bottle from Cabela’s and also picked up the proper drinking cap for it which I LOVE because your drink won’t pour all over you. I have the 18 oz. and my husband has the 36 oz. bottle. I can’t get over how cold it keeps my drink. It’s a little heavy to carry around but it’s still worth it. I fill it up about 6 times a day. 9. 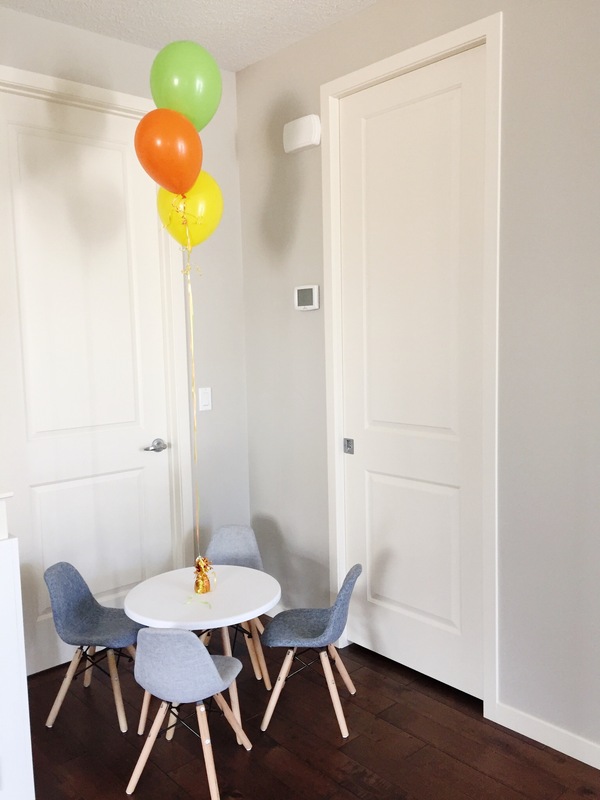 Style Craft Children’s Table & Chairs – If you follow me on Instagram you’d have seen that I bought this adorable children’s table and chairs from HomeSense. I bought four upholstered chairs in grey and blue ($49.99 CDN each) and a white round table ($79.99 CDN). I also found a very similar option on Wayfair! It blends right in with our main floor furniture which I like, especially having those fabric chairs. 10. 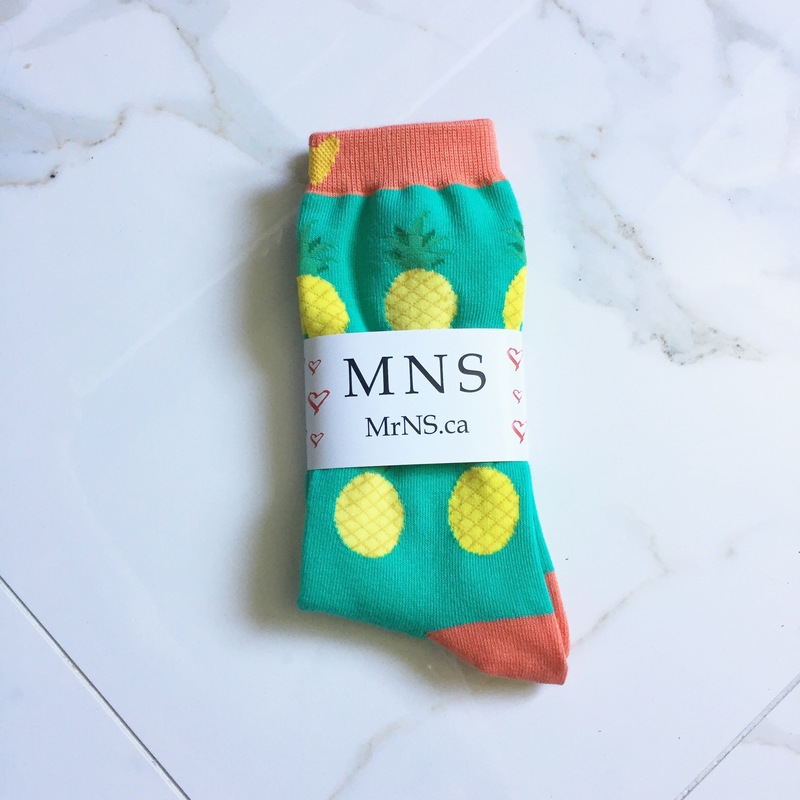 Mr. Nice Socks – Pineapple Socks – I bought these fun pineapple socks for my husband from the pop-up market at the Southcentre Fashion Show this past spring. And, I ended up gifting the socks to him for Father’s Day. What’s great about this local company out of Edmonton is that for every one pair sold, two pairs of warm socks are donated to those in need. The organizations they work with are The Mustard Seed, The Camrose Open Door Association, The Downtown Eastside Women’s Centre, The Hope Mission, and Hull Services. Check out all of their unisex socks here. I especially love the YYC ones!!! Socks are always a great gift because everyone always needs a new pair! 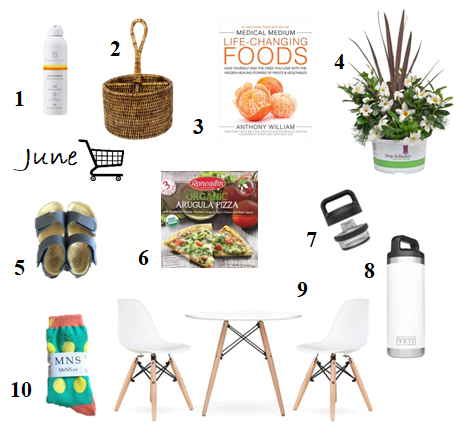 Let me know in the comments below if you own any of the items listed above. I’d be curious to know what you think.